I took this picture while on patrol with the British Army in Kabul, Afghanistan. We had been visiting a school in the region as part of a ‘hearts and minds’ initiative (see Photo Insight, AP 25 February) and spent some time on the streets of Kabul, trying to capture shots of people going about their business. I hadn’t been to Kabul before, so I didn’t have any preconceived ideas about what I was going to photograph. I was just looking for interesting images that would tell the tale of everyday life here. As I was photographing, I spotted someone riding towards me on a bicycle and thought it might make a good image. At first I couldn’t make out what I was looking at, but I soon realised there was a child sitting at the front. I had two cameras: one with a long 70-200mm lens and another with a wider optic. I wanted to make the child stand out as much as possible – to isolate him as the focus point in the frame – so I used my Canon EOS-1D Mark II with the longer lens to throw the background out of focus and to create a nice tight shot. When the man and boy were too close to use the long lens, I switched to the camera with the wider lens. I had to react within a couple of seconds of seeing the man and boy as they were riding straight towards me. They weren’t that far away, perhaps only 50 metres or so. This is why I generally work with two cameras – in situations like this, where there isn’t much time to prepare and decisions have to be made instinctively, it isn’t usually possible to switch from one lens to another. My exposure was 1/800sec at f/4 and ISO 200. Although I make decisions instinctively, I have a checklist in my head of the sort of shots I want. In addition to shooting the scene using a long lens (a ‘detail’ shot), I’ll use a wider optic to show more general views of the subject in its environment. This allows you to come back with a range of images from different focal lengths and angles. You have to be careful when shooting in this way, though, because you could fall between two stools and end up with nothing. On this occasion I walked out into the road so I could capture the man and child straight on. I wouldn’t recommend doing this for obvious reasons, but sometimes you have to do these things to get the shot. If I’d taken this image from the side it would have been difficult to make out that this was a child. If you follow the simple rules of making sure your image is sharp and correctly exposed, it increases your chances of getting a good shot. I wouldn’t have been able to make this image if the exposure hadn’t already been set. Whenever I’m out photographing, I constantly ‘read’ the light in my head as I’m walking along and set my exposure accordingly. I’m always tweaking my exposure. It means I can react within a split second when something happens. 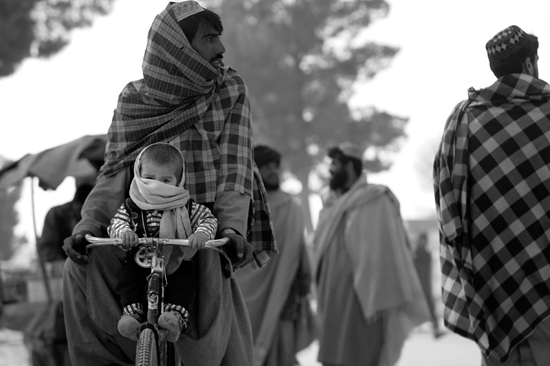 This wasn’t a breaking news story – it was more of a feature-led assignment about daily life in Afghanistan. Consequently, I was able to take my time and look at the images back at the army base. Typically, when covering a breaking news story I have to decide whether or not to wire a picture back to the agency immediately and risk missing a ‘better’ picture. As a press photographer, there is always this conflict of interest. Inevitably, you don’t always make the right decision, but you have to keep these times to a minimum otherwise you won’t work any more! I can’t send the images back as raw files because they are too large, so I send as small a file size as is feasible. Besides, when you’re working in a place where internet and phone signals might be at a premium, you can’t send large files. I’m constantly thinking about deadlines. Simple things like knowing the deadlines of the various publications around the world and the time differences between countries are crucial. Now, with the internet, there is always a deadline to be met. Working for a wire agency means you have to shoot in colour. A newspaper won’t be able to do anything with a black & white image. If I shoot an image in colour, I will keep it in colour, but if I shoot in black & white, it stays in black & white – I don’t chop and change. If you are doing a project, I believe you should either shoot the whole thing in colour or in black & white. People seem to think that a black & white image has more gravitas but I don’t think this is true. Often if a picture isn’t good enough in colour it won’t be good enough in black & white. You soon learn to read a situation and know what makes a strong composition. It’s better to photograph something and in hindsight say, ‘It’s no good,’ than to miss an opportunity and say, ‘I should have photographed that.’ Every photographer shoots plenty of images that he or she doesn’t file and there is no such thing as a 100% hit rate.